I’m pretty sure that frequent travelers will agree with me when I say McDonald’s and 711 are two worldwide chains savior for us. Simply because these establishments has something that’s common to our place! The first time we tasted the burger in McDonald’s in HongKong, we didn’t like it so we settled for pancakes during our entire tour. The second time we went in HongKong, our dinner is kinda’ late so we took chance with McDonald’s. That’s only when we realized that their chicken tastes much better than what we have here in the Philippines. From then on, we made sure to try McDonald’s that we’ll see in every country that we go to differentiate the taste. So far, the chicken in Kuala Lumpur, Malaysia is our top favorite and my birthday lunch meal in Bangkok, Thailand (on this post) takes the second place. 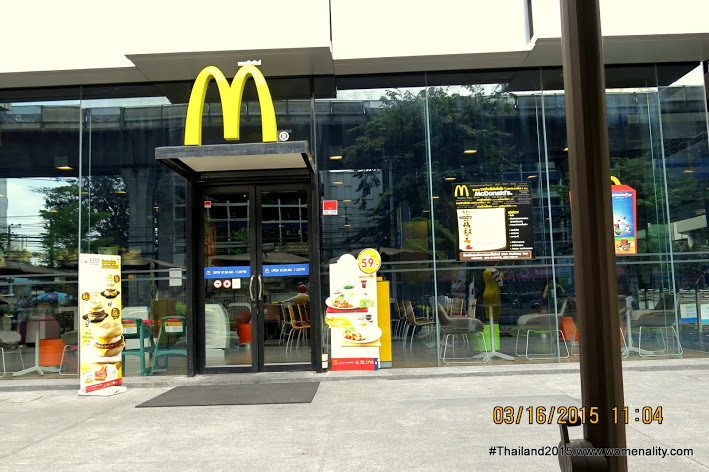 Below are other photos of the McDonald’s in Siam, Bangkok Thailand just within the vicinity of Holiday Inn Express Siam. McDonald’s is also one of the reasons why we chose Holiday Inn Express in Siam. We thought of having late dinners and it’s open until midnight. We also tasted their Churros but I can’t find a photo of it. Sorry about that. Oh, look at the menu… they are really different! This is called McKao Kaprao and currently #2 spot of our favorites. Mc Donald’s Receipt. Looks like Coke is almost the price of the chicken. It’s really nice to discover new things and taste something different from the same restaurant you grew up with. We are excited to taste more of McDonald’s from other countries. How about you? Would you mind sharing your favorites too from where you are? I’d love to know! Important note: The aim of this article is to share our experience with McDonald’s in Siam Bangkok. The restaurant did not asked or paid me to do this article.